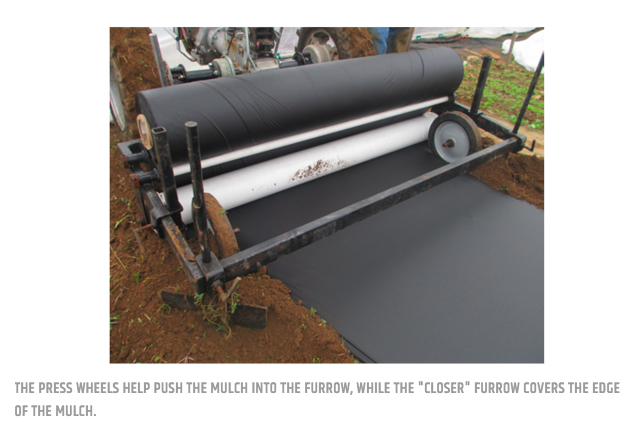 The 4-foot Plastic Mulch Layer is yet another useful and simple attachment for small-scale farmers or professional growers. The unit handles 4-foot wide plastic mulch and is perfect for laying plastic mulch over 30” raised garden beds, provided that the beds are consistent in shape and size, and are not over 6” tall. Compatible with models 749 and up, the Plastic Mulch Layer lays plastic mulch and simultaneously buries the edges of the plastic on both sides to keep it anchored to the soil. If used on 28” to 30” wide raised beds, the plastic will fully cover the top and sides of the bed and bury the plastic at the bottom. If used on non-raised beds, up to 36” of plastic will be exposed. Like any plastic mulch layer, this attachment performs differently in differing soil types, and needs to be adjusted accordingly. The “openers” (opens the furrows), “press wheels” (presses the plastic down into the furrows), and “closers” (close up the furrows to bury the plastic) are all easily adjustable. These 3 items must be adjusted in line with each other for proper performance. See accompanying photos for a visual aide. 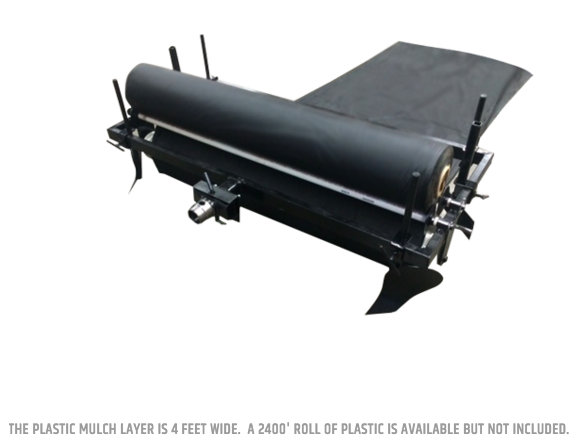 This Plastic Mulch Layer is designed for use with a 2400′ roll of plastic for best handling. 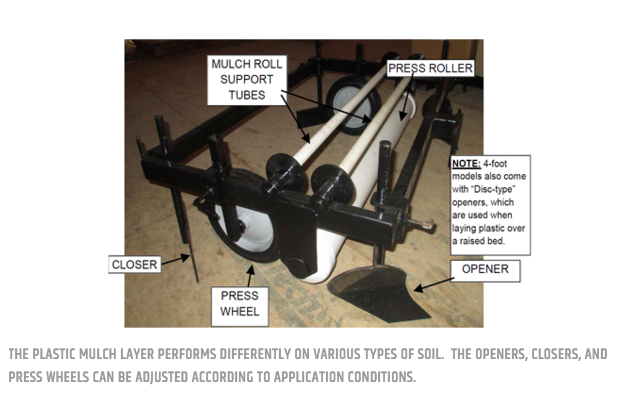 It includes a set of “plow openers”, which are used for flat-beds, and a set if disc-openers for use on raised beds. It also has a “floating” mounting hitch at the PTO connection point, allowing the unit to be steered slightly for course corrections. A Quick Hitch bushing must be installed on the tractor, since the unit’s mounting hitch has an integrated Quick Hitch tang. To avoid installing the plastic mulch over wheel tracks, the tractor’s wheels need to straddle the bed. To straddle 30” wide raised beds, the tractor needs to have a set of 16” Wheel Extensions installed. A 5×12 or 6×12 wheel size is recommended for adequate ground clearance. For models 732, an additional axle spacer is required due to its axle design. 4 feet wide, which exposes up to 36” of plastic on a normal bed and 30” on a raised bed. Extra set of disc “openers” included for use on raised beds. Raised beds can not exceed 6” in height. 2400′ plastic mulch sold separately. Oval Quick Hitch pin hole allows the unit to “float”.